Port Said is known as a revolutionary city, famed positively for its resistance in the wars with Israel, negatively for the February 2012 massacre of soccer fans during the confusing days of the Arab Spring. But fortunately, Port Said has never been a sectarian city, said Fr. Kyrillos Ghattas of St. Mina Coptic Orthodox Church, one of eight Coptic Orthodox churches serving an integrated Christian population, among fifteen overall. In the past Port Said was a cosmopolitan mélange of different cultures, and the spirit of coexistence continues to this day. This heritage makes Port Said a natural home for the Egyptian Family House, witnessed in the warm Easter greetings offered to Bishop Tadros. The governor and top officials from the Azhar, police, and local university spoke of the importance of local relations and congratulated the Christians on the occasion of their feast. And though Port Said has experienced far less sectarian tension than other parts of Egypt, no city is immune. Ordinary struggles, mixed with family pride and factional attitudes, can poison relations even between neighbors. What is necessary is a system of wise men attuned to sense the early warnings, and to engage in early response. 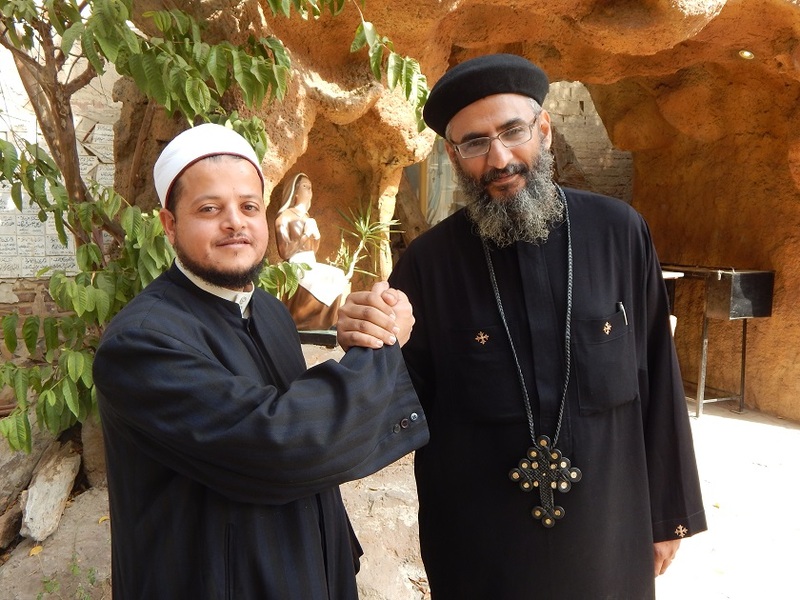 The Family House was established in 2011 as a joint initiative between the Grand Sheikh of al-Azhar Ahmed al-Tayyib and then-Coptic Orthodox Pope Shenouda. Worried over the sectarian violence witnessed in Iraq, they invited the Catholics, Protestants, and Anglicans also to work together to preserve national unity in Egypt. The Egyptian revolution slowed implementation, but over time committees were formed for this religious body to communicate directly with cabinet ministers. And a mandate was received to create local branches at the grassroots level, so that national unity might come to mean more than just the ‘hugs and kisses’ of top level religious dignitaries, interpreted by many as masking a neighborly but latently sectarian people. This year marks the third year of one of the Family House’s most dynamic projects. Seventy participants – thirty-five imams and thirty-five priests – live together for three days, four times a year, being trained in dialogue and practical partnership. Each of the previous two years witnessed an additional seventy, some of whom went on to help establish Family House branches in Alexandria, Luxor, Mallawi, and among others, Port Said. Fr. Ghattas was one of the participants in the year two training with his colleague Sheikh Hassan Abdel Dayim. Together they are two of the 27 members of the Port Said central committee, among roughly 100 active participants. Dayim explained part of their work is to visit together in schools, youth centers, hospitals, and conferences. Some sort of public Family House work takes place on average once a week, he said. A dispute among teenage boys in May 2014 provided a good example. A Christian youth flirted with a Muslim young woman, and her brothers intervened and began insulting him along with the Christian neighbors who had come to his defense. The situation worsened as a fight broke out and one of the Muslims suffered severe bruises and a broken arm. Such a scene is not uncommon in Egypt, when harassment touches family honor. But involving opposite religions, the situation threatened to escalate and both sides filed reports with the police. One of the Christians was arrested and held in jail. Fearful, the Christians fled, vacating their home for a week. Fr. Ghattas heard of this issue through neighborhood gossip and consulted with Dayim on how to handle it. When he went to visit the families he found the Muslim home full of knives and bladed weapons. The Christians, meanwhile, called for help from a handful of relatives from Asyut in Upper Egypt who came with guns. The family itself had migrated to Port Said around five years earlier. Fr. Ghattas pressed upon both families the need for a peaceful solution, speaking in the name of the Family House. But he made use of the Family House status as an approved government institution, warning of the influence he would have also with police. Combining religious and civic responsibilities, Fr. Ghattas led both families to agree this was just a problem between youths which spiraled out of control. He also helped the Christians to accept that they were primarily at fault, having begun the flirting and causing the bodily harm. From their own initiative the family purchased two sheep for roughly $300 – a substantial sum in their poor neighborhood – and gave it to the offended family. The Muslims slaughtered the sheep, placed their hands in the blood, and pressed the mark against the walls. Afterwards some of the meat was distributed to even poorer neighbors. Through this act reconciliation was achieved, the Christian was released from prison, and the families today continue to live in peace. Such is a practical demonstration of the value and promise of the Family House, but like the initiative as a whole the fruit is still ripening and not yet fully grown. Reviewing the incident, Dayim emphasized that ideal Muslim reconciliation should not require compensation. Furthermore he recognized that though marking the wall is a common cultural practice, the blood is unclean and should not have been touched. Fr. Ghattas reflected that it might appear the Christians ‘purchased’ the reconciliation, and though the Muslim elders rebuked their children for the insults, there was no apology for the lesser share of their family’s guilt. Fr. Ghattas believed the Muslims felt they were only slightly at fault, and were doing enough by forgiving the offense and returning to live in neighborly peace. But both sides withdrew their complaints with the police immediately after the reconciliation session, and through several visits afterwards Fr. Ghattas can testify that peace has indeed prevailed. Much about the Family House seems all right. But privately some imams and priests express less than conciliatory attitudes about the other. Though some cities have witnessed continuing cooperation, others have not yet been able to translate budding relationships into joint work on the streets. But even where there is success, after three years there will be only 210 religious leaders who have been actively trained in the program. Surely the same spirit exists among hundreds more, but what is this among millions of Egyptians? ‘Sowing the values and morals of citizenship is like a drop in the desert,’ said Lubna Abdel Rahim, a trainer in the program and unit leader in the Ministry of Education, speaking of her ministry’s efforts. Such is the promise of the Family House, still awaiting the nourishment to flower further. Port Said is a worthy place to begin and if the Easter visit is any indication, the effort is well under way.